Receive regular lessons, tips, and videos about grammar. 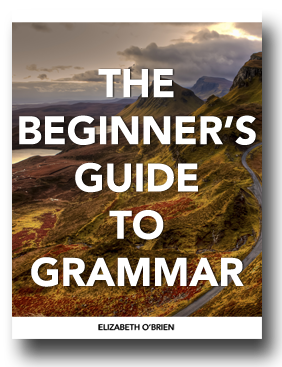 You can get started today with The Beginner's Guide to Grammar. This guide was a lifesaver for me. I used it to study for an English exam, and it helped me understand everything well. Thank you so much and keep up the good work! Thank you for all of the wonderful grammar ideas. I use them in my classroom and when I do tutoring. My students love your examples. I can't thank you enough for all of this wonderful material you email to me. I'm writing just to say THANK YOU for sending your great newsletter! I enjoy watching your videos and I think you're doing a wonderful job. I wish you and your family all the best! I appreciate your easy-to-follow explanations. I enjoy your emails. They are so encouraging and enthusiastic. 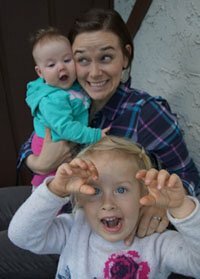 Here I am with my daughters. Alice is hamming it up, and Lenora is cuddled into me.